People on the campaign trail always make statements that sound good. The reality is something else. Irfaan Ali is someone who has always found time to talk to me. We shared some interesting moments when he was Minister. Overall, he is a decent person. I remember doing a story on a fellow who had defrauded Guyana Water Inc. and got dismissed. Of course, he was not the first to stare the truth in the face and decided to contest it in the courts. This fellow filed a writ. I remember calling him and asking him if he were crazy, if he thought he could win in the courts. It did not matter to him, because I could not seek any compensation from him. And that is a problem with the legal system. People can sue and cost you money. Then they drop the suit, but you have already paid your lawyer. Your money goes down the drain. I went to Irfaan and asked him whether something was wrong, mentally, with his former employee. Irfaan picked up the phone and called the fellow. He simply told him to drop the suit or have some worse indiscretions become part of the lawsuit. I never heard from the fellow again. There was the Irfaan who hosted a housing exposition. I spoke with him on site and got an insight into his thinking. He was shrewd and he was familiar with the contractors. I found him a great fellow. That was not the same person I saw when he hosted his first press conference. He knew that there would be questions about his qualifications. There was information that some of his qualifications were forged. The degree from Sunderland, at least the document he presented, was flawed. The certificate would usually carry the candidate’s registration number. That was missing from Irfaan’s. There were other discrepancies that were never addressed. Jagdeo simply told reporters that the issue was not up for discussion. Irfaan, rather than address the issue, decided that it was all out there and that he had nothing more to say. When the reporters insisted, he simply said that his leader had spoken about it and that he had nothing further to say. For the man who hopes to be president, it is not ingenious to hide behind the leader. He gave the same answer to some other questions when he should have been putting his own stamp on things. In the wake of the press conference, people began to doubt his leadership capability. On the trail, outside the capital, Irfaan spoke of creating 50,000 jobs. When I heard this claim, I said that he had to be a dreamer. For starters, he is claiming that there are 50,000 Guyanese who need jobs. Where are these Guyanese? He spoke about getting the support of the private sector. A simple analysis would reveal that those whom Irfaan is targeting are already employed. Even if he were to reopen all the sugar estates, he could not find 50,000 people. And when he talks about reopening the sugar estates, he parrots Jagdeo. Jagdeo argues that it is more expensive to keep the estates closed than to have them function even at a fantastic loss. Surely, that could not be true. Irfaan is also talking about unemployed sugar workers. He described them as starving. Anyone who knows Guyanese would know that they simply do not starve. We always find something to provide an income. Some of the sugar workers are already employed. The people who are complaining about the closure of the sugar estates are the vendors and shop owners who made their money from the sugar workers. One man called me to say that when the sugar estates were operational, he grossed a couple hundred thousand dollars each day. Of course! He was a beneficiary of the huge subsidies the government was pouring into the sugar industry. Irfaan more than most knows that the future is not in sugar. He knows that the oil revenue would be a boon to any government. In fact, many would not even worry about employment. Government would fund many welfare projects. His biggest problem at this time is to prove that he is his own man. He certainly did not do that at his press conference. He hosted the conference at the Office of the Opposition Leader. Why? He could have used Freedom House, the headquarters of his party. He kept referring to his leader. He is supposed to be the leader, the man who should be making the decisions. But if he keeps looking to Jagdeo, then people would conclude that Jagdeo is really running the country. To rely on Jagdeo is to sink his hopes, because the older folks have their issues with the opposition leader. He was never able to shake off the reports of corruption directed at him. So for Irfaan, who has a cloud over his head, to team up with a man who had an umbrella of corruption over him, is certainly not the best thing. Then he uses Kwame McCoy as his moderator. 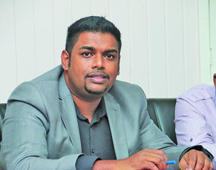 He could not have done worse, given Kwame’s image when he sheltered under Jagdeo’s wing. To the casual observer, Irfaan is Jagdeo’s boy, Jagdeo’s shadow.